The definite report of the DYNAMILL project was presented at the end of 2015. This is a European collaboration project within the 7th Framework Programme driven by IPT Fraunhofer, with the objective of improving the machining of thin-walled parts. Ten European companies from 7 different countries have cooperated in the project, and FRESMAK has participated as an expert in anchorage systems. The machining of the parts mentioned is a real problem for all the manufacturers. As the parts are thin and elongated, a vibration source occurs during the machining, making the finish very problematic. Bad finishes (lines, marks, etc.) lead to the need to carry out a final polishing operation on the parts, which sometimes has to be done by hand. This leads to a large number of rejected parts and makes the process more expensive. The DYNAMILL project was thus divided into three work modules: process planning, adaptive anchorage devices and cutting conditions. Fresmak has worked exclusively on the 2nd module, which was comprised of five phases, and whose aim was to develop the final technology. Firstly, the importance of the anchorage and its influence was studied. Then, passive damping systems were introduced. Next, work was carried out with adaptable localiser systems. Later on, the integration of sensors into the anchorage devices was studied. Finally, the possibilities of using those sensors to create active anchorage devices were analysed. In 2015, the possibility offered by a clamp in passive damping was studied in depth. To this end, the behaviour of difference types of jaws mounted either in the SC clamp or in a standard MB-2 was studied. “Maxidamp” material jaws with high damping capacity, bronze jaws, aluminium jaws, hydraulic jaws, among others, were used. 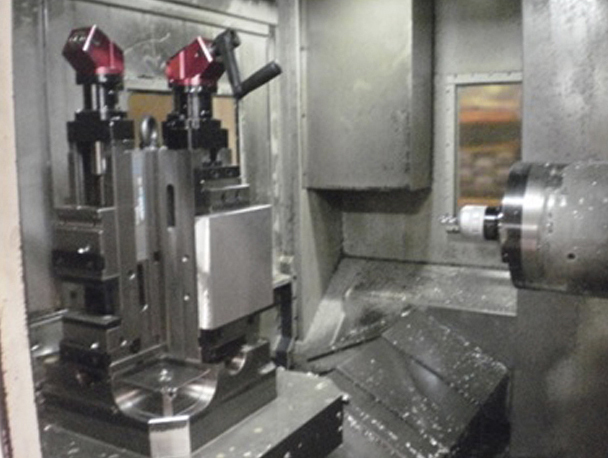 Real machining tests were performed with all of them and the results were studied using a roughness meter. The Fraunhofer Institute, on its part, using a SC clamp, has developed a model with active damping based on inserting sensors and activators derived from piezoelectric technology into the clamp. The participation in this project has represented an important challenge for FRESMAK and it has allowed it to enter the world of vibrations caused by machining and their consequences. Through finite element studies, it has also make it possible to improve the design of FRESMAK, S.C. self-centring clamps.